Since the 1980s, Reeves Gabrels has paved a musical career that has included stints as a guitarist, songwriter, singer and music producer. He’s composed musical scores for both video games and movies and his versatility and virtuosity has put him in collaboration with well known musicians around the globe including David Bowie and Robert Smith. 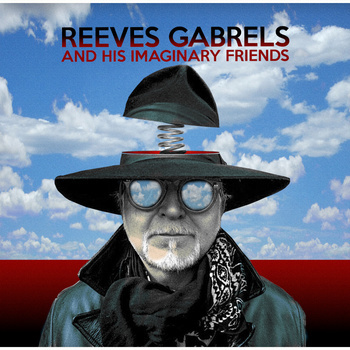 Currently he fronts Reeves Gabrels and His Imaginary Friends based out of East Nashville. And, as if that wouldn’t keep him busy enough, in 2012 he became a member of The Cure. Beyond your work in a multitude of bands over the years you’ve also worked on the soundtracks for two PC games: Omikron: The Nomad Soul and Dues Ex. Did you approach these projects in a different way than you would music for live performance? In the late 90s I had become smitten with the popular Logic/Protools combo that allowed me to both midi sequence (Logic) plus record and manipulate audio. When I did the music I was really interested in manipulating the studio… sort of breaking the forth wall like when an actor in a movie steps out of character in a scene, looks at the camera and addresses the audience. I was trying to tear that fabric of reality. You can hear it as well on my 2nd solo album “Ulysses (Della Notte)” and to a smaller degree on the Bowie’s, ” Hours…” record that I co-write and co-produced around that time. With all of those recordings, live performance was the furthest thought from my mind. You are most notably a guitarist with an impressive resume and body of work, but you’re also a composer and song writer that appears to fear no genre. Is there a common element or singular approach you bring with you as you create new music? I try to testify in the moment. If there isn’t sweat and blood on the tracks then I don’t feel like I have served the music in the larger sense. You mentioned in a FB post that Johnny Marr was your neighbor? Where was that and have you two ever collaborated? In the late 80’s/early 90s Johnny had a place a few doors down from me in London. We never collaborated but one afternoon when he came by for tea he left my old Les Paul Junior in an altered tuning. After he left I wrote the music for what later became “Shopping For Girls” on the second tin machine record. That is as close as we have come to collaboration so far. You started performing music in high school and really went after it starting in the eighties. What have you learned about gear over the years? Did your tone evolve, etc? I guess the biggest thing I learned is what works for me VS what doesn’t. And, that evolved out of what sonorities I respond to. I love reed instruments, I don’t respond to harpsichords. What does that mean for me personally? I like rich fat sounds with overtones. I find I don’t like thin, percussive sounds lacking in sustain. So my ear and emotional and tonal response to what I heard brought me to the distorted electric guitar. I think tonally I am in a constant state of evolution, at least I hope so. Personally, one major gear event in the early 80s was the arrival of the Pro Co Rat into my world. It was a revelation. I was not a tube screamer kind of guy. To this day I do not get why anyone would get excited about a tube screamer or any of the thousands of clones. In the late 70s I stopped listening to rock music and guitar players as a source of inspiration and began exploring other genres and instruments. Following the trail indicated by Jeff Beck’s Blow by Blow and Steely Dan, the harmonic possibilities of jazz beckoned. I began listening to keyboard players for harmony and horn players for melodic ideas and old school R&B singers for phrasing. Hrani Nas, Ravi Shankar and many others are wrapped up in there too. With your reputation, you could just about call on anyone to play music with. Can you tell us about your Imaginary Friends, Kevin Hornback and Jeff Brown and how you all started playing together. We started playing together in late 2006 after I moved to Nashville. They were part of the small East Nashville music community that I ingratiated myself into after moving there. We became friends and when it was time for me to start playing my own music again, we just sort of fell together. One of the things I have always tried to do is play and record with people who are my friends. Musicians that I like as people. If music is a conversation I like being surrounded with people who have something interesting to say and have a cool point of view. One of the things I learned early on as I met many “famous” musicians with Bowie is that the only real difference between a great musician and a “famous” musician is simply that one is famous ( and the other isn’t). Very often, the hard working gigging musician that lives down the street is the better player and the more interesting person. Anyone with the money to spend can hire “famous” all day long. But to put a band together with your friends is special. I prefer to play with my friends (who just happen to be awesome). I’m lucky that they like playing with me. Also, you’ve been playing with The Cure since 2012, how did that come about? Robert Smith has been a friend of mine since 1996 and I met the rest of the members of the cure in 1997. I played on the Cure’s “Wrong Number” single in 1997. Robert and I wrote a song for my album Ulysses in 1997. Jason Cooper, Robert and I wrote and recorded a song called Sign From God for Trey Parker’s movie Orgazmo (under the band name Cogasm). Plus, in the late 90’s, I had joined the band onstage quite a few times. Over the last 10 years Robert and I had stayed in casual touch but in late April 2012 Robert asked me if I wanted to play guitar with the Cure for the summer. Somewhere in the middle of the summer of 2012 they asked me if I would like to join the band, and suddenly, it’s 2015. You’ve been all over the world in a lot of venues: Do you have a venue that you just love to play in? The Hammersmith, Apollo and Royal Albert Hall. For small clubs, The Family Wash in East Nashville, the Lizard Lounge in Boston and the Horn in St. Albans. I also really like festivals just for the whole experience and the many, many variables from gig to gig. It’s an adventure. What bands are inspiring you these days? I may be coming late to the party but I just saw live performance of a band called Big Wreck from Canada. They seem to have everything I enjoy rolled up in one heavy 3 guitar package. I like Explosions in the Sky, Queens of the Stone Age and I rummage thru the past quite often. Sometimes its stylistic thing other times compositional. And, there are some perennials like Jack Bruce who was amazing on every level. I think it should elevate the song. Be it’s own little story inside the larger piece and it should move the listener – even the most jaded. Simple. hah. People who play in bands know that when on equal footing individual personalities can drive a band to destruction. Having collaborated with countless musicians have you ever clashed with bandmates (no need to name names) and do you have any tips on getting past it and back to the creative process? It’s the balancing act of being child-like without being childish. That’s my best borderline spinal tap answer. What’s the story on the paint jobs on the Phase 90, DL4 and bypass strip? At one point in time in the early years of the century I got into sort of relic-ing a lot of my gear. A few years before back before it became a thing like it is now in the guitar manufacturing world. I was making custom knobs and amp head enclosures and painting, burning and engraving guitars and bases for friends. There are pictures of some of that stuff on my album from 2005 called “Rockonica”. I was into a sort of used technology look. Those pedals are surviving remnants of that period. I see you’re using an older TC Electronic Stereo Chorus +, what do you prefer about this unit? I like the flanger setting on that pedal. The Loop Master bypass strip has the Kaoss pad and the TC Electronic in dedicated loops? Why do you put the TC in the bypass loop (tone/buffer issues)? I found that to my ear there was some signal deterioration with both of those units when they were off but still in the circuit. The loop master solved that. Looks like the Boss GE-7 has a nice mid-boost configured, do you use this for leads to cut through the mix? The GE 7 was modded by the thru-tone folks and is very quiet which lets me punch the midrange up for solos pre S.I.B tube varidrive. I feel that gives me more drive from the tube in the S.I.B. in those frequencies where the guitar is most vocal. I use the ascend pedal after the varidrive for actual decibel-wise solo boost. In an email you mentioned that your desert island pedal is the Blackstone Appliances Mosfet. – Why is that? It is a great overdrive/ distortion pedal. It is not a half hearted, transparent kind of pedal. when you play thru the Blackstone the amp almost becomes secondary. It is almost as if the amp is just there to function as the power amp to the front end the pedal provides. It is the perfect get out of jail free card when I dont know what kind of amp I am going to be using or what the musical requirements are going to be. It is always in my guitar case when I go out to sit in or jam. Why is it not on the Cure or Imaginary Friends board? It was on the Cure board the first summer (2012) that I was in the band. After that summer, as I settled into the music new songs were added and a larger more versatile sonic palette became necessary. I re-thought my amplification and began using custom built Audio Kitchen amps and re-examined my gain structure which brought me to Donner Rusk’s Bearfoot FX pedals. That allows me to stack several different pedals in different combinations for a wider array of overdrive tones which lets me cover the tones necessary to play the Cure’s music. With my power trio I leave the Varidrive on all the time and ride the volume on my guitar. It is an organic way for me to operate in my band where I am also the lead singer. It means that I am not looking down at the pedal board while I am trying to sing. I have yet to find a solid state distortion pedal that will do that. The response of the Varidrive’s 12ax7 (which is getting hit with the proper high plate voltage like it would in an amp ) works great with my Reverend Signature Model Guitars, especially their proprietary bass contour control. I have used the Blackstone on many occasions with Reeves Gabrels and His Imaginary Friends when we have done quick in and out shows (this years NAMM show, for example). But when I have the luxury of bringing my larger pedal board I go with the Varidrive for those reasons. Over the years, Robert Smith has relied almost solely on Boss Effects for creating the Cure tone. What comes to mind, is the Boss BF-2 Flanger. Did you have any challenges matching those tones outside of Boss pedals. 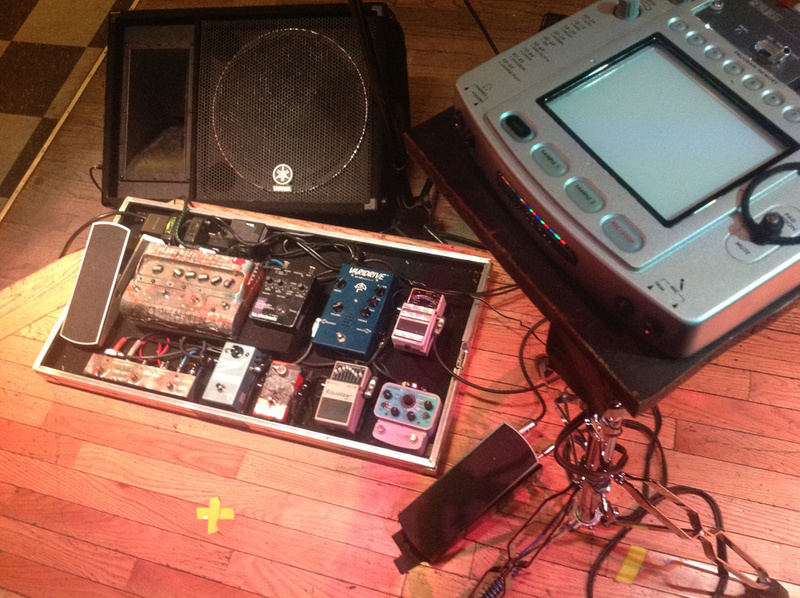 Live, Robert covers a lot of those tones with his boss effect loaded BCB 6 pedal board (which includes a BF-2). My ears are pretty good with effects so I am able to match the sounds that I need to even if I am using pedals made by a variety of manufacturers. If a part needs to be super exact the chances are Robert is already covering it. What would you say is the pedal on your board that most embodies the Cure tone? My vintage Boss Dimension C.
The ravish is the only one trick/ one song pony. Everything else gets used in different combinations. What combination of pedals forming the bulk or base of tones to perform most of the Cure library? I tend to use the Dimension C and the Bearfoot Model H as a sort of “homebase”. Switching between standard guitar and Bass VI are there any issues with pedal or amp settings between the instruments? I have a separate amp (Hiwatt D 103 and an Orange 4×12) and separate small pedalboard that I use for the Bass Vl. 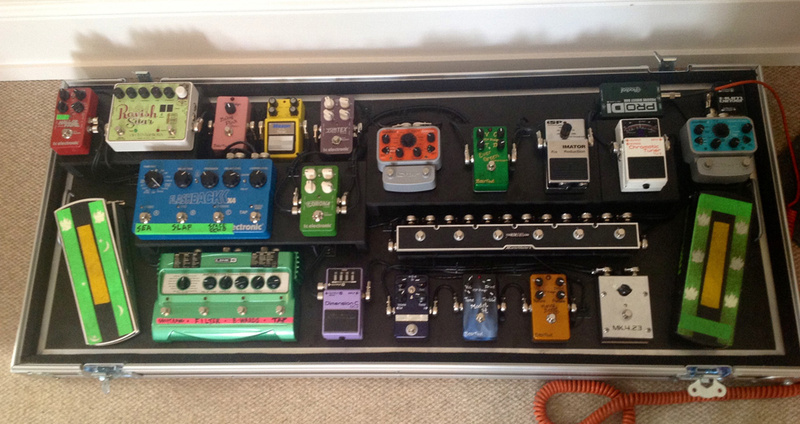 That board has a Timmy overdrive, Bearfoot Pale Green Compressor, Boss Chorus and a Boss DD-3. The Source Audio Soundblox 2 Multiwave Distortion is a fantastic distortion with many options. Do you find yourself making adjustments/changes between songs, or do you set-it and forget-it with this pedal? I use three Soundblox 2 pedals with the Cure. The Modulation, the Bass Envelope Filter (a recent addition) and Multiwave for fuzz . Those sounds are set and never change. The internal noise gate on the Multiwave is very useful for sounds like that. With my ‘Imaginary Friends’ I use the Multiwave for the octave fuzz setting with most of the gain dialed out and the sustain all the way up. It is instant Jan Hammer. Nothing else out there sounds like that. The 6 channel GigRig QuarterMaster is a great tool for controlling those effects in combination or keeping things close. What pedals on the board are managed via the QuarterMaster? And why? Everything that is run in mono before the overdrive and distortion pedals. I use it that way to keep the noise floor down, to prevent signal loss and for the buffering it provides. even with high quality ( lava cable) and high quality effects you will eventually experience some high end loss if you don’t get those effects out of the signal path when not in use. I also use the GigRig system for power. my tech, Chris Boyle, and I were both amazed at the difference the GigRig power made in the tone when we were done building the pedal board. Delay is an important effect when it comes to the Cure. I notice you have the Line 6 DL4 and TC Electronic Flashback X4. How are you using these delays? Ie: preset delay speeds, for particular songs, multiple delays running simultaneously, etc? A little bit of all of the above. The Edge of the Deep Green Sea has a specific set dotted quarter setting on the TC while I use the Line 6 for a multi purpose delay that I use on a number of songs that I tap the tempo into and use the thru tone expression pedal for delay level and feedback. Ultimately, it is a fairly organic old school approach. The fact that I take a fairly organic old school approach when I could more easily be using something like a Fractal Axe Fx system and have it come out the same way every night. how boring. For both the Cure board and the board you use for the Imaginary Friends, you’re using a Line 6 DL4 with Thru-tone Ex-5 in an Ernie Ball chassis. What about the EX-5 do you prefer versus other expression pedals? I can stand on it and it doesnt break. Plus, the travel of the pedal is longer and so more “expressive”. The reason I searched for a better expression pedal is that the line 6 expression pedals break constantly because of the amount of flex in the plastic housing. I notice you have a lot Bearfoot FX boxes on the board? What about that company and pedals do you like? First and foremost they sound amazing. Second, they stack like a dream. They use extremely high quality components and the lack of noise floor with their overdrive, distortion and compression pedals is astounding. Big thanks to Reeves for spending some time with us. Make sure to check out the Imaginary Friends album that is out now on Bandcamp. Photo of Reeves Gabrels on home page by Mauro Melis.